Bypass is a pick-up-and-play arcade challenge which will test your concentration and reflexes. Collect orbs to earn points while dodging blocks, however each checkpoint will increase the speed of the game! Bypass also comes with a local leaderboard, 12 achievements to unlock and customization to tweak the difficulty of the game to your liking. Bypass - Endless Arcade Action - Out Now! 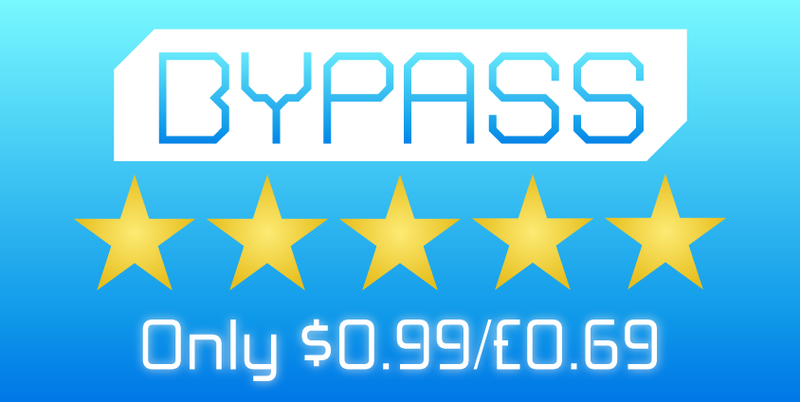 Bypass is available for Android devices and you can download it here. It will be available on the Amazon and Samsung store in a few days and, more importantly, we will be releasing on iPhone/iPad in a few weeks. We will fixing reported bugs and tweaking gameplay (if required) so your feedback is essential, let us know via the reviews or contact us to let us know what you think.